In a little more than seven minutes in the early afternoon of Feb. 18, 2021, NASA's Mars 2020 rover will execute about 27,000 actions and calculations as it speeds through the hazardous transition from the edge of space to Mars' Jezero Crater. While that will be the first time the wheels of the 2,314-pound (1,050-kilogram) rover touch the Red Planet, the vehicle's network of processors, sensors and transmitters will, by then, have successfully simulated touchdown at Jezero many times before. "We first landed on Jezero Crater on Jan. 23rd," said Heather Bottom, systems engineer for the Mars 2020 mission at the Jet Propulsion Laboratory in Pasadena, California. "And the rover successfully landed again on Mars two days later." 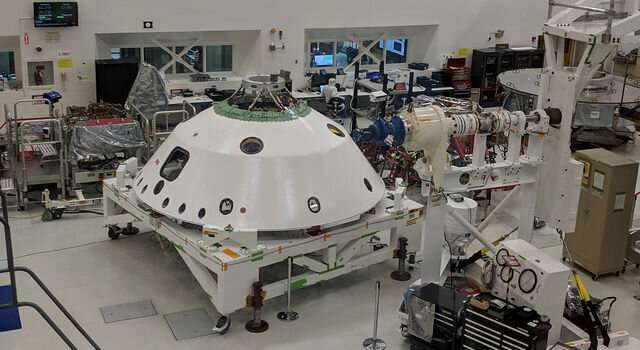 Bottom was the test lead for Systems Test 1, or ST1, the Mars 2020 engineering team's first opportunity to take the major components of the Mars 2020 mission for a test drive. Over two weeks in January, Bottom and 71 other engineers and technicians assigned to the 2020 mission took over the High Bay 1 cleanroom in JPL's Spacecraft Assembly Facility to put the software and electrical systems aboard the mission's cruise, entry capsule, descent stage and rover through their paces. "ST1 was a massive undertaking," said Bottom. "It was our first chance to exercise the flight software we will fly on 2020 with the actual spacecraft components that will be heading to Mars—and make sure they not only operate as expected, but also interact with each other as expected." The heritage for Mars 2020's software goes back to the Mars Exploration Rovers (Spirit and Opportunity) and the Curiosity rover that has been exploring Mars' Gale Crater since 2012. But 2020 is a different mission with a different rover, a different set of science instruments and a different destination on Mars. Its software has to be tailored accordingly. "Virtual workstations and testbeds are an important part of the process," said Bottom. "But the tens of thousands of individual components that make up the electronics of this mission are not all going to act, or react, exactly like a testbed. Seeing the flight software and the actual flight hardware working together is the best way to build confidence in our processes. Test like you fly." On the day before ST1 began, the High Bay 1 cleanroom was hopping with "bunny suit"-clad engineers and technicians assembling, inspecting and testing the mission's hardware. The next day, Wednesday, Jan. 16, the room was eerily quiet. The majority of workers had been replaced by two technicians there to monitor the flight test hardware. 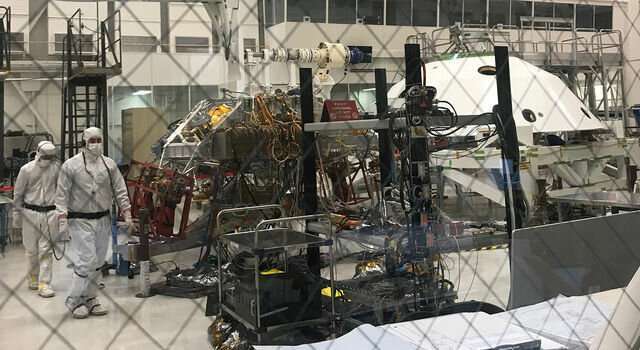 Lines of electrical cabling—umbilicals—were added to provide data and power to the spacecraft's cruise stage, back shell, descent stage and rover chassis, which have yet to be stacked together. The ground to in-flight spacecraft (and in-flight spacecraft to ground) communications were handled by X-band radio transmission, just like they would be during the trip to Mars. ST1 began with commands to energize the spacecraft's electrical components and set up thermal, power and telecom configurations. While all the spacecraft components remained in the cleanroom, Bottom and her team had them thinking they were sitting on top of an Atlas 541 rocket 190 feet (58 meters) above Launch Complex 41 at Cape Canaveral on July 17, 2020, waiting to be shot into space. After a successful launch, they time jumped 40 days ahead to simulate deep space cruise. How would the software and hardware interact when they had to perform navigation fixes and trajectory correction maneuvers? And how would they work when simulated events didn't go as planned? The team looked for answers on the operators' computer screens in the test operations room beside the cleanroom. "From the test operations room, you could look out the windows onto the cleanroom floor and clearly see the flight hardware," said Bottom. "Nothing was visibly moving, but underneath the outer structure, there were flight computers swapping sides, radios sending and receiving transmissions, fuel valves moving in and out, subsystems being energized and later turned off, and electrical signals being sent to nonexistent pyrotechnic devices. There was a lot going on in there." On Jan. 30, the Mars 2020 test team was able to close their 1,000-plus page book of procedures for ST1. They went two-for-two on Mars landings. They also launchedfour times, performed deep space navigation, executed several trajectory correction maneuvers and even tested a few in-flight off-nominal situations.This first evaluation of flight hardware and software, over a year in the making, had been a thorough success, demonstrating where things excelled and where they could be improved. When these new changes have been investigated on both a virtual workstation and in the testbed, they will have their chance to "fly" in one of the many other systems tests planned for Mars 2020. "One of the future scenario tests will place the rover inside a thermal chamber and simulate being on the surface. It will step through mission critical activities at some very low Mars surface temperatures," said Bottom. "Both literally and figuratively it will be a very cool test."